Mormon Wookiee: #105: One of the Two Best Weekends of the Year. My favorite weekend (well, until the next one in six months) has come and gone once again. 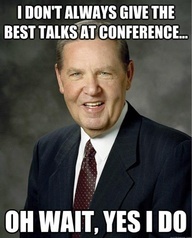 Oh, how I enjoy General Conference--so much to take in, so much to remember, and so much to recommit to doing better. I feel refreshed and ready to do my best. I'm excited to download the talks and listen to them again as I drive to and from work.